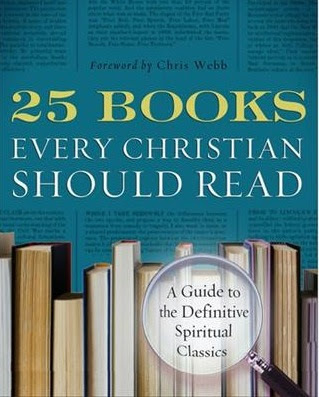 Do you think of yourself as well-read and well-rounded Christian? You may notice that a lot of these recommendations were written centuries ago. This is a good thing for two reasons. First, many are in the public domain and can be downloaded free here. Second, reading only books that have been written in the last 40 years is common practice for contemporary Christians, and it fuels both arrogance and ignorance about the faithful saints throughout history. I'd love to challenge you: pick up either 25 Books or one of those on the list that you're unfamiliar with and work at it to find out for yourself why its on this prestigious list. Tip #1: As you read, don't evaluate the book based on whether you, or your pastor, would agree with everything the author asserts. Instead, posture yourself to hear from God as you read. See what affect it has on your heart or mind. What memories or experiences it brings into focus. And let the book be a launching pad for prayer. Tip #2: A lot of these books can be purchased as audiobooks, which can be a great way to enhance your commute or exercise time. I'd love to hear: Which of these have you read? Which books would have you chosen? Good looking list; I'm honestly not sure if I have read any of those, but I have certainly heard of several and heard from several of them. Time for me to get cracking on the list! I want to thank all the contributors of this book for your service to the body of Christ. I have 19 to go. Soul Sailor I commend you for intending to read them all, but bear in mind that growth in the spiritual life isn't measured by checklists but by loving God and loving neighbor--something it takes deep and ruthless self-awareness and as well as a cadre of honest people around you who've been invited to tell you the truth. You may perceive that a ton of these suggestions were composed hundreds of years prior. Second, perusing just books that have been composed in the most recent 40 years is regular practice for contemporary Christians, paper writing and it fills both egotism and lack of awareness about the steadfast examples of piety all around history.